Essential Lessons in Straight Bowing for Beginner Violinists and Violists. Playing a string instrument is one of the most complicated skills known to mankind. Kids can easily get frustrated and discouraged when learning, especially when they find that they can’t make the lovely sound they expected. Learning good bow control is fundamental but tricky. From the start, the bow has a mind of its own. It refuses go in the right direction and slithers up and down the string. What a horrible noise! For a child, this isn’t any fun. Nowadays, many children are used to being entertained and expect everything else to be as entertaining as their favourite activities. They don’t want to spend dull hours practising. They’d rather be playing games. As a parent or teacher, you know that learning a musical instrument is fundamental to building a bigger and better brain and to developing useful life skills. It is so frustrating to us that for many kids, the process of learning can be dry and boring. It doesn’t have to be like this! Imagine your kids being so intrigued by bowing games that they are happy to practice. Just think how would you feel if you had dozens of games and strategies to help kids to learn basic bow control. Picture the pleasure you’ll get from seeing your child’s accelerated progress as their playing skills improve. See their self-esteem grow as they master each new bowing game. Hear a real improvement in beautiful tone as you help them to discover new strategies in bowing. With 40 Great Games to Teach Straight Bowing, we have done all the research for you. We are excited to present this exciting new resource of 40 tried and tested games and strategies to help a young violinist play with a straight bow. All you need to make working on bow control fun and effective. 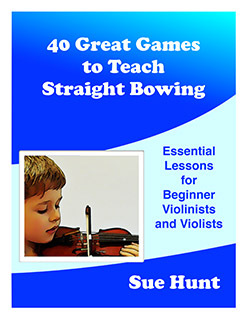 40 Great Games to Teach Straight Bowing is an e-book that you can download which means that you could be reading and playing the games in as little as 5 minutes. ✓ Save yourself lots of time. You won’t have to search for games, or spend hours making your own resources. ✓ Stop spending your hard earned money on games, books and resources. You will have more straight bowing ideas and games than you will ever use. ✓ Learn how to be a fun teacher or parent who can make bowing skills enjoyable and interesting. You will never be short of new ideas or activities. ✓ Find simple ways to develop kids’ neuromuscular skills. ✓ Discover lots of games that target different learning styles for visual, kinesthetic or aural learners. ✓ A set of lucky dip cards to use in practice sessions. ✓ Easy ways to reinforce basic bowing skills with kids who are struggling. 40 Great Games to Teach Straight Bowing makes basic bowing practice happy and intriguing. ✓ These games are more than bow work. They are entertaining, perfect for to keeping your kids interested in practising. ✓ This is your secret to making learning basic bowing skills interesting. When you are looking for quality bowing games resources for practising at home or in the teaching studio, 40 Great Games to Teach Straight Bowing is the resource for you. ✓ Discover how to help your young musicians. When WORK is FUN, your kids are motivated and their bowing skills improve quickly and easily. For great ways to teach straight bowing or easy bowing games and ideas for home practice, 40 Great Games to Teach Straight Bowing shows you ways to making bowing lessons more fun and effective than ever before.